Iraqis gather near the wreckage of a car after a roadside bombing Saturday in central Baghdad. Kidnappers threaten to kill two Americans and one British hostage. U.S., Iraqi accounts of Baghdad fighting are at odds. The U.S. strategy in Falluja has come under question. 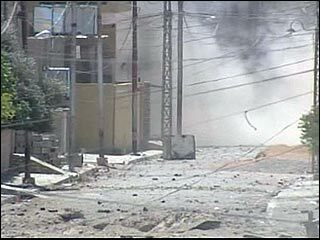 BAGHDAD, Iraq (CNN) -- A suicide car bomb detonated Saturday in front of the Iraqi national guard headquarters in the northern city of Kirkuk, killing 19 people and wounding 67 others, including guardsmen and recruits, Iraqi officials said. Police said a car sped toward the gate in front of the headquarters and that national guardsmen fired on the vehicle before it detonated. The bombing was the deadliest in a series of attacks Saturday. In a separate attack, Sheik Kadum Hani, a tribal leader in Albider, and his driver were killed when unknown gunmen opened fire on their car, the commander of the Iraqi national guard in Kirkuk said. The sheik was traveling from his home in Kirkuk north to the town of Dibis. Two of the sheik's family members were wounded in the attack. Elsewhere, a roadside bomb missed its apparent target of a U.S. convoy in Baghdad and hit a private car, which caught fire after the bomb detonated, an Iraqi Interior Ministry representative said. It isn't known how many people were in the car or the extent of their injuries. The explosion happened in the busy commercial district Karrada. In Baquba, north of Baghdad, a bomb went off near the technical institute, injuring 11 people, the Iraqi Health Ministry said. Most of the injured were students at the school. In the northern city of Mosul, gunmen opened fire Saturday on a convoy carrying an oil manager, killing five of his bodyguards and wounding four others, according to a hospital official. Witnesses said the assailants, armed with automatic weapons, pulled up in two vehicles alongside the convoy carrying the manager, Mohammed Zeybari. Two U.S. soldiers were killed in the second of two explosions Saturday on a road to the Baghdad airport. Eleven American servicemen were also wounded by the two car bombs, the U.S. military said. The first car bomb exploded as a convoy approached the al-Amil Bridge leading to the Baghdad airport Saturday afternoon, Iraqi and U.S. officials said. Three injured soldiers were taken to a hospital, officials said. About 30 minutes later, two U.S. Army soldiers were killed by a second blast while investigating the first bombing, officials said. No explosives were found on the road, said Gen. Pete Chiarelli, commander of the 1st Cavalry Division. Also Saturday, the Arabic-language television network Al-Jazeera broadcast a video that it said showed two Americans and a Briton whom captors seized two days ago in Baghdad. The network said the Jihad and Unification group threatened to kill the hostages unless female Iraqi prisoners were released. The developments followed a bloody day Friday in Iraq. A suicide car bomb detonated near an Iraqi police checkpoint on a busy street in central Baghdad, killing at least eight Iraqis and wounding 41 others, according to the Iraqi Health and Interior ministries. Three police and five civilians were killed, spokesmen for the ministries said. An explosives-laden vehicle approached the police checkpoint on al-Rashid Street and detonated around 12:40 p.m. (4:40 a.m. ET), a police spokesman said. The street is a busy shopping area, with cafes and street vendors. Earlier Friday, another car bomb detonated on Haifa Street in Baghdad, killing two occupants of the vehicle, according to a representative for the U.S. Army's 1st Cavalry Division. U.S. forces opened fire on the vehicle packed with explosives after it tried to break a security perimeter on Haifa Street, the 1st Cavalry Division representative said. The vehicle then exploded, killing the two inside. No U.S. or Iraqi forces were wounded. A U.S. Marine from Lynnwood, Washington, was killed in action Thursday in Anbar province, the Department of Defense said Saturday. Cpl. Steven A. Rintamaki, 21, was assigned to the 1st Expeditionary Force out of Camp Pendleton, California. Iraq's national carrier, Iraqi Airways, resumed international flights Saturday after 14 years of being grounded by war and sanctions. U.S. forces carried out an airstrike Friday night that targeted a building in central Falluja, west of Baghdad, where they said followers of Jordanian militant Abu Musab al-Zarqawi had gathered. Hospital officials in Falluja said two people were killed and 10 others wounded. The U.S. Marines announced "Operation Hurricane," described as "clearing operations" in Ramadi, west of Baghdad, aimed at disrupting the Dahman terrorist network, which is linked to al-Zarqawi. CNN's Thaira al-Hilli and Faris Qasira contributed to this report.